I cannot really add much more than my recent comments on the Cumbria floods of early December, denying a role for AGW really isn't sound as I explain in that post. However it is an issue worthy of some comment. In October I posted the results of calculations that show that 2015 is very likely to be a new record warm year. That was based on data to September, now I have data to November and 2015 will be a new record likely by a massive margin. In Paris the Great and Good have met and decided that it would be a good idea to keep AGW to below 1.5 to 2 degC. We'll see how that pans out, any effect will be seen in the coming decades in the rate of increase of atmospheric CO2, which is currently running at about 2ppm/yr. Whilst the COP21 talks were ongoing, what seems to me to be a more important item of news (in terms of dealing with AGW) has been announced. Engineers and scientists in Germany reported what seems to me (as an outsider) to be a potentially exciting development in fusion power. Cumbria in North West England has been hit by severe floods as a month's worth of rain falls in one week, the floods are as severe as the floods in 2009, which at the time were claimed to be a 1 in 1000 year event. Has Anthropogenic (human driven) Climate Change got anything to do with this? The problem with what I've been doing in place of sea ice over much of this autumn is that I can't blog on it. You don't give away ways of doing things that you intend to make money out of, it's bad business. Then I was waiting at the bus stop over the weekend and it occurred to me that I often talk about probability distributions, but haven't explained what they are. In an interview recorded before the recent Paris massacre Prince Charles has recently told Sky News that he thinks that Climate Change is one causal factor in the ongoing Syrian situation. Rejecting him out of hand does not seem sound to me based on the available evidence. Last week while updating my spreadsheets for the first time since September* and generally catching up I realised that there is a feature that I've not addressed before, the change of rate of sea ice gain in Autumn. *The PIOMAS data is now updated, last updated in August, see top box on the right of the page, top link. In mid June I posted a blog post asking about whether we were facing a crash this year. This was based on the US Navy's ACNFS Model, which I have previously called HYCOM. Shortly after the post the model version I had used was put behind a password wall, the US Navy had realised that it wasn't signed off for public release. Now it seems there is a problem with ACNFS, as found out by Peter Ellis at the Sea Ice Forum. Basically the massive melt ACNFS showed this summer was due to a glitch in the model. These things happen, the only people who don't make mistakes are those who never try anything, and the more complex one's endeavour the more likely mistakes are. So my question in mid June about us facing a crash this year was based on flawed data. This doesn't affect any of my recent blog posts because the password walling of ACNFS made me suspect something was up, on that I was wrong in the end, it was walled for another reason. But after the PIOMAS data I suspected something was off with ACNFS, by my June Status post I used ACNFS but came to the conclusion there would not be a crash this year. I will be using ACNFS for ice movement, but for other metrics will probably rest use of it for the remainder of the summer season, perhaps longer, to give them time to get things sorted. Taking the Arctic Ocean summer season as June to the sea ice minimum, around now is the middle of the summer. In this post I look at the state of the ice mid summer, and offer a guess of what the minimum will be. I have previously written about the Arctic Dipole, and note that it now has a Wikipedia page. Over the last two years it has been largely absent, leading myself and others to ponder whether it was a transitory phase over the 2007 to 2012 period. It doesn't seem to have been transitory, it has dominated July so far and looks set to continue throughout the rest of July. My expectation is for it to continue into August, that however is just an expectation based on behaviour in 2007 to 2012. What would it take to get to 1 million kmsq? I now have data to 15 July for regional extent (thanks Wipneus). With two months to go to the middle of September, the period for which the minimum can reasonably be expected, what would it take to reach 1 million kmsq by this September? In my previous post I covered, amongst other issues, the large region of collapsing ice shown in the Chukchi Sea. Now with three days more data it is clear that Chukchi is suffering a rout. I had to post the following image because with clear skies it really paints the picture of ice state in the Pacific sector of the Arctic Ocean. Ice state is excellent for significant losses this year, a re-run of 2013 and 2014 looks very unlikely. Tamino has recently posted a summary of the drought situation in California. Frankly if I lived there and read that post (or read the news!) I would be selling up and moving out before it gets worse. Anyway, now that I have finally got round to doing it, this seemed like a good excuse to finally get round to updating the UK rainfall plot. June's Sea Ice Prediction Network (SIPN) summary has taken so long to come out I had stopped checking for it. Commenter Nightvid let me know last night that it was out (Thanks!). And whilst I am on the subject of prediction I will include my prediction for Cryopshere Today Area (CT Area). What role did the GAC of 2012 play in the 2012 crash? I don't know if you have already read and discussed conclusions presented in this article, but it suggests that GAC -2012 was not a major factor in record ice retreat. I thought it may be useful to the discussion on preconditioning of ice melt and summer ice cover. "The impact of an intense summer cyclone on 2012 Arctic sea ice retreat". Zhang et al 2013. Are we facing a crash in 2015? This blog post was based on data from the US Navy's ACNFS model (known as HYCOM in this post). It has turned out that the massive melt shown in the model was due to a technical glitch. This post is kept as I don't delete posts, but it is no longer considered valid. Correction statement with links to details here. It's bad form to blog on consecutive nights, but I'm now going to say something that has been on my mind for over a week. Last year, and the year before, I recollect a lot of excitable discussion at the forum in June about how we were going to see a crash in sea ice. A lot of talk about how the weather would shift and massive losses would start, of course as we now know, that just didn't happen. Just a quick post with some graphs, because things are looking better in the Arctic Ocean for a more exciting melt season than the last two years. All of these graphs use anomalies from the 1981 to 2010 average. June seems to represent a crucial period of pre-conditioning for the summer melt season, with large June sea ice losses in years of large summer losses, such as 2007, 2011 and 2012. The purpose of this blog post is to consider what is happening in June this year, and the prospects for the rest of June and the summer. This will be a rather short post, I will have much more to say about the June PIOMAS data. But for now, partly due to work, here's some late comments on PIOMAS May data. Not all of the NCEP/NCAR data is available, and PIOMAS is yet to be released, but with the data available there is still a lot to cover about sea ice state in May 2015. This is the prediction I will be submitting for the June Sea Ice Prediction Network 2015 predictions. I wasn't aware of the mid May call for early season predictions, as I use April data I could have put this in for that round. Ten months ago I posted about my change of mind, from thinking that a fast crash was a very real possibility to expecting a slow transition of the Arctic sea ice to a seasonally ice free state. I have now finished the series of posts detailing my argument. I should start by clarifying; by a slow transition I do not expect the summer sea ice to last into the 2050s, I suspect that around 2030 we will see the first summer with an extent of less than 1 million km^2. For the Arctic Ocean to become seasonally sea ice free the Central Arctic region must become sea ice free. What is happening in PIOMAS in the Central Arctic, and what is likely to happen in future? The BCE region is the region covered by the Beaufort Sea, Chukchi Sea, and the East Siberian Sea. For there to be a virtually ice free Arctic any September soon, the BCE region must melt out early in the season. This post is the penultimate post in my argument that we face a slow transition of the Arctic sea ice, after which I will wrap up the argument with a summary, before moving on to watch this season. Crysophere Today Area (CT Area) is the dataset produced by the Polar Research Group at the University of Illinois. I've stopped using it since last year, I now concentrate on NSIDC Extent and PIOMAS. But it has a peculiarity that makes it worth picking up again. Who's Paul Homewood? It doesn't really matter, he's just another tedious climate change denialist, but the irony of this amused me. An Early Warning for Summer Sea Ice Crashes? Just a quick post on on of the elements I've looked at while trying to improve prediction for the summer. This comes with a caution, because the method outlined only 'predicts' two recent sea ice summer loss events, the 2007 and 2012 crashes. Time will tell whether it is of any use in the future. April 2015 Status. Part 2. Part 2 of my summary of April sea ice state focusses on ice thickness as seen in PIOMAS. So for those who have been awaiting the more detailed thickness distribution plots by region here is the detail that may help form opinions as to prospects for the coming melt season. April 2015 Status. Part 1. This post is the first of two blog posts examining ice state as of April 2015. April extent is very low but this has little impact on the coming season. A greater factor is thickness and the thickness distribution of the ice, and the best available tool for that is the PIOMAS sea ice reanalysis system. Due to the length of this post I will address thickness breakdown of PIOMAS data using both grid box effective thickness and the sub grid thickness distribution in a post in the next few days. Is Arctic Sea Ice Like a Cup or a Ball? Extent has been definitely falling, this is accompanied by rather intersting conditions in the Atlantic sector of the pack. What is going on there? I hazard a guess concerning the very low extent in Barents. In this post I'm going to explain a PIOMAS metric that I will be using from now on. I will also give a first look at this metric. The gridded data for the 'sub-grid thickness distribution' is contained in gice files, and I've finally started to use them. Data is now in for March 2015, the early maximum is confirmed, temperatures over autumn/winter continue the pattern of recent years, and the volume increase in PIOMAS remains. This year takes volume back to 2010 levels, but the impact of 2007 remains clear. My entry for the 2015 Sea Ice Prediction Network (SIPN) is given at the end of this post. I've just visited Cryosphere Today, and noticed a new heading 'Arctic Climate Feedbacks'. From the date of the video it references, it's not really new, the Youtube video is dated 22 January 2015. Anyway it led on to three short but impressive TED videos that neatly link together (well I think they do). Each video is only around 5 minutes long. I have processed images from the Drift Age Model of Fowler/Maslanik/Tschudi to draw attention to the extent of old ice in Beaufort. 2014, like 2013, enters the melt season looking more like a pre-2007 year in the highlighted region. The Slow Transition: The Mono-modal Spike. In my previous post I looked at the implications of winter thickening for the question of whether Arctic Sea Ice faces a rapid crash or a slow transition to a seasonally sea ice free state. There is another aspect of the PIOMAS data which throws light on this, and which shows something I have commented on in recent winter commentaries. PIOMAS data is often used in statistical extrapolation to support claims of an imminent crash of summer sea ice. However Zhang 2010 ("Arctic sea ice response to atmospheric forcings with varying levels of anthropogenic warming and climate variability" PDF) uses the very same model in a future projection and finds no such crash. What is going on? Which approach and conclusions are to be trusted? This post is acting as an appendix for a blog post I'm writing at the moment. In this post I describe a very simple physical model of sea ice growth and the conversion to a Freezing Degree Days format. Where is the ice in the Bering Sea? Like me, you've probably noticed the singular lack of ice in the Bering Sea, it is very unusual and the cause is northward air flow. That's as good an excuse as any for my first blog post of the 2015 sea ice year. The PIOMAS data for December 2014 is now out. So here is the usual summary. I start with the usual map plots of thickness, this time I've done an animated gif for September to December thickness. UK Rainfall 2014, a sneak peek. I just, rather optimistically, checked UK rainfall data to see if it had been updated. It hasn't, but I was reminded that while the annual data is for January to December, the seasons run from December to November (using meteorological seasons). The main index I will continue to use will be the calendar year, January to December, but while I wait for PIOMAS data, here's a quick early look at UK rainfall for 2014. 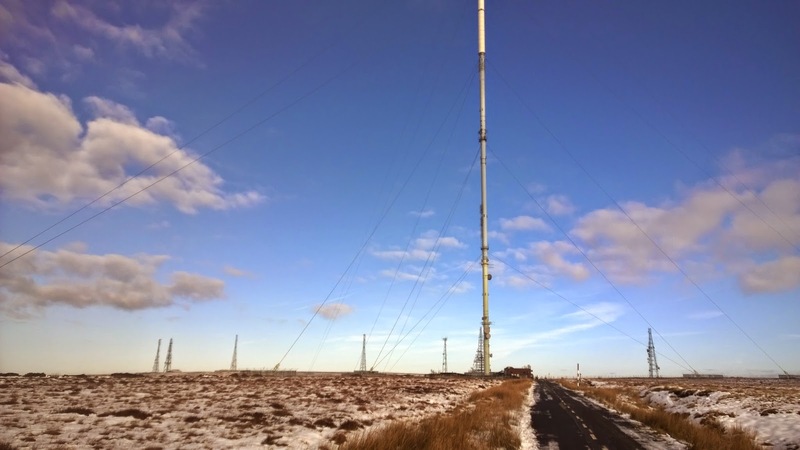 Having been enjoying the long Christmas shutdown of the company I work for, I've been getting out and about, a few days ago I took a couple of busses, had a good walk, and got myself up to Winter Hill. It coalesced some thoughts I've had for years.